Package size: 30" x 12.5" x 4"
★Broad Compatibility - This mobile TV stand fits most 19" to 37" LCD, LED flat screens of all major brands up to 44 lbs within 200x200mm. 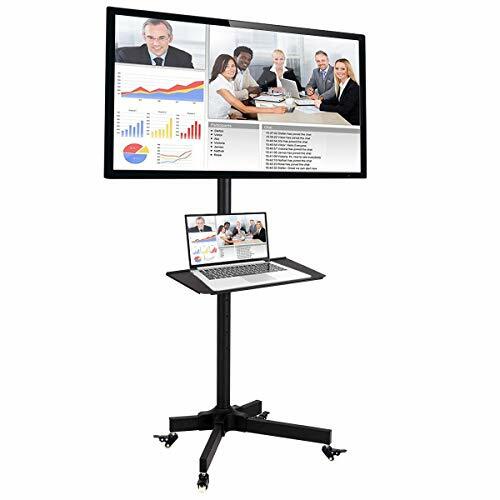 ★Height Adjustable - The rolling TV cart can be adjusted up to 60.5" with +-15° screen tilt function for better viewing angles and a 17" to 27" height adjustable AV device tray to fit your height preference. ★User-friendly Accessories - Integrated cable management inside the tube provides neat display for power and AV cords, together with a storage shelf for cable box, Roku, TiVo, PlayStation, Xbox or anything else to create an entertainment center. ★Safe and Sturdy - The TV bracket is built with heavy-duty steel with four braked casters for effortless rearrangement. Smooth swivel caster wheels with brake ensure stability. ★Easy Assembly - The TV cart comes with all necessary hardware and a graphical installation guide. No need to drill holes on your wall, saving much on house decoration. It takes less than 20 minutes to install. It is easy to install and safe to use.